Welcome to 2019 Population Fun.com! If you’re looking for specific information related to the population of continents, a country, cities, states and/or regions, you’ve come to the right place! This website has been especially designed as a resource for teachers, parents, children and students of all ages to have fun while finding the data you need to complete a school project or just answer a puzzling question. We offer informative reports on geography, census data, history, population projections based on current birthrate, life expectancy and immigration as well as male-to-female ratio, ethnic, religious and political demographics, languages spoken, colorful maps and more. Get enlightened now! Common questions our visitors have are “What is the population of Cairo, Egypt in 2018?” or “What was Bhutan’s population in 2017?” or even “What is the population of the United States projected to be in 2019?” While this information is readily available on the internet, we try hard to put it all together in an interesting and innovative way that allows you to have fun while learning more about the world around you. Can you guess the countries with the top five highest populations? China and India are obvious, but do you know which countries are sure to be on the list soon? 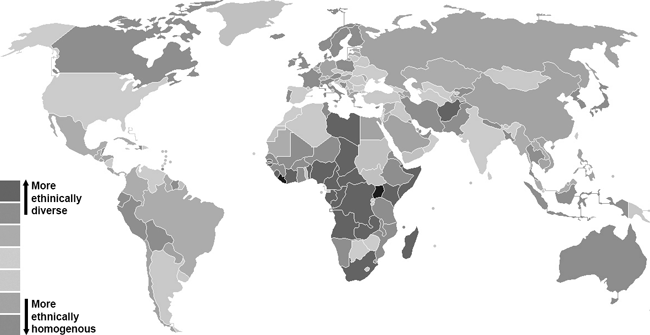 The ethnic diversity of the world population is fascinating and this greyscale map helps us visualize it. Nations like Canada, Mexico, many South American countries like Ecuador, Bolivia and Peru are relatively diverse while the most ethnically diverse countries are in Africa. Others though are more ethnically homogenous, as are South and North Korea, most European nations, China, Australia and Japan. Surely this affects society as well as the overall health of these countries. How so? Read our simple and fun guides to many countries on this site! You’ll find the ever-increasing list on the right side of any page or you can search at the top-right for specific terms involving 2018 population, people, country, world states, language, Philippines, china, russia, india, egypt, north korea, japan, religion (for instance “what is the muslim population of Russia in 2018”), ethnic, and nepal. Please bookmark us and visit often as we’ll be posting new and updated population and census data as well as demography, population pyramid and geopolitical news occurring within countries we’ve reported on as it happens. We are also working hard on publishing travel guides for some of the world’s most interesting countries,islands and cities as well as current January, 2018 demographics data based on projected census numbers and information on each destination’s monetary currency. We’ll also be reporting on wars and armed military conflicts.